當初看上 Jupe 是因為他的 reverse engineering 支援, 看起來似乎頗有希望. 在 forward engineering 部分的 UML tools 已經夠多了, 而且甚至有點雜. 除了對於 XMI 支援以及呈現的問題, 不同的操作 style 也造成這些 forward engineering tools 合用互補的不易. 然而在 reverse engineering 的部分, 則是連這樣的缺點都還沒辦法有 ^^b , 因為好用的 reverse engineering tools 實在太少了, 有些可能要在 commercial 才看的到. 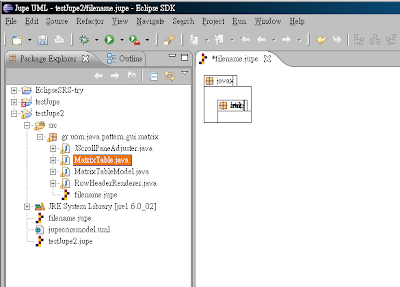 Jupe 相依於 Eclipse GEF, Eclipse UML2 frameworks, 同時嘗試支援 forward and reverse engineering. 在今年 (2007) 三月左右停止繼續維護與開發, 原因不明. 在使用上, Jupe perspective 右手邊是 forward engineering 用的 UML 元件選單, 這跟大多數的 tools 一樣, 就沒什麼好說的. 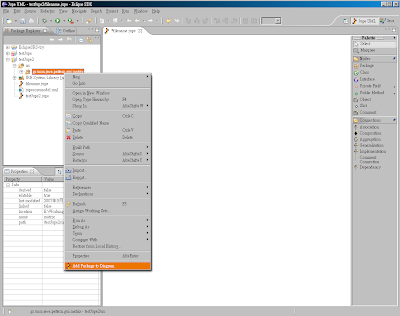 而在 reverse engineering 部分則是可以從 package 或是 class 直接增加到 class diagram 內, 操作上是還算直覺. 但是在呈現上的結果到是有很大的問題. 僅以加入一個 class 來說, 圖上會連同外面的 package 一起出現, 但是圖形卻不會自動調整大小, 整個就擠在一起. 而且對於 graph boundary 沒有作 checking, 所以可以隨便移動, 離開原本的 package 也是可以. 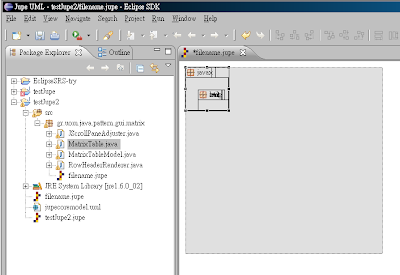 綜合以上總總, 實在不能算是派的上用場的 tool, 而只是 yet another failed Eclipse plug-in. 有空真該來統計一下 fail / success 的 Eclipse plug-ins 比例. 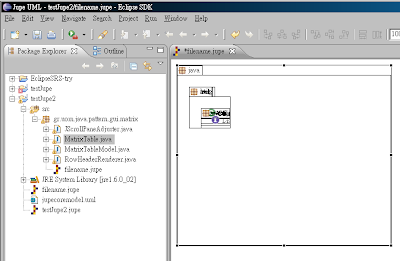 Eclipse platform 身為一個響譽軟體開發社群的 IDE, 是否對於如此多的 fail plug-ins 也負有一些責任呢 ? 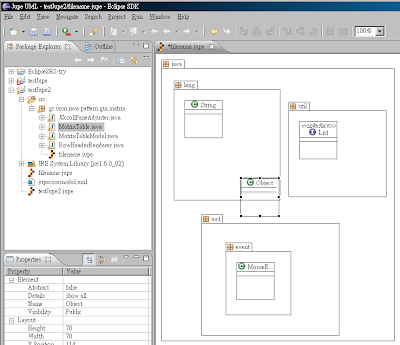 This entry was posted on 上午9:25 and is filed under code generation , IDE , java , reverse engineering , UML . You can follow any responses to this entry through the RSS 2.0 feed. You can leave a response, or trackback from your own site.